A traditional village with local amenities - restaurants, bars, beaches, a local square with live entertainment and Catalan dancing, diving clubs, boat hire, fishing, train station, vibrant markets, fantastic coastal/countryside walking, fabulous cycling. Visit the beautiful medieval towns of Collioure and Carcassone, Andorra for tax free shopping or Spain only 4 kms away with its pretty coves and historic towns like Roses, Cadaques, resorts of the Costa Brava. Local trains go to all the towns along the coast or further afield to Barcelona or Perpignan. Kitchen with Aga, microwave, washing machine, dishwasher. Dining area, lounge with 2 sofa beds, TV, DVD, video, satellite. Downstairs 2 doubles with en suite showers, 1 double, 1 room with bunk beds, bathroom, toilet. Outside swimming pooling surrounded by decking, two sun terraces, BBQ, ample parking. The villa has stunning views of the sea with magnificent sunrises and sunsets with vineyards 50 metres away for beautiful walks. We live in Dunstable, Bedfordshire where we have lived for some 35 years! We always holidayed with a touring caravan in Europe when our three children were young and came to love France having toured all over. Having watched the TV programme 'French Leave' where Jean Bertrand Race brought his family to spend a year in the Languedoc region of France we decided to explore the possibility of buying a holiday home. We were amazed at the choice but were completely blown away when the agent showed us a plot of land overlooking the Mediterranean. The views were spectacular and we agreed to buy it there and then! It took 18 months to have all the plans and permissions approved. We worked with a local French architect to design the house to optimise the views and it took a further 18 months to complete the build which was finished in March 2008. We absolutely love it!! and are delighted that our family and friends do too. We love the ease of visiting both Spain and France with all the lovely resorts along the Costa Brava perfect for a day visit - Portbou, Calella, Llanca, Estarit, Palomas, Cadaques, Roses, Empuriabrava, Lloret de Mar and Tossa de Mar. You can also enjoy all the French resorts along the coast Banyuls with its numerous restaurants and bars, Portes Vendres with its busy harbour, Collioure - without a doubt spectacular, Argeles sur Mer for its lively shops and activities and vast sandy beach and beautiful port. The local transport, both bus and train are very reliable and reasonable so you don't have to take the car if you don't want to. The local walking is amazing with coastal paths going from the village right the way through to Argeles sur Mer in one direction and from Cerbere through Portbou and onwards in the other direction. To the rear of the property is a beautiful vineyard walk through the mountains behind the villa. For keen cyclists the routes are undoubtedly challenging with the Trans Pyrennean Route from Biarritz ending in Cerbere! There are always lots of enthusiastic cyclists in the area. There are two diving schools in the village for people of all capabilities and the entire coast line is a national heritage reserve so the diving is spectacular. Bedrooms 1 and 3 have en suite showers with toilets. There is additionally a separate bathroom with bath and shower over and separate WC on the ground and first floors. The bathrooms all have heated towel rails, mirrors, etc..
We stayed in this beautiful Villa that over looks the Mediterranean Sea. The views were spectacular and so very calming. The area is wonderful with lots of places and small towns and villages to explore. A car is recommended. This villa would be suitable for both couples and families and it’s fully equipped with everything you need. Thank you for the wonderful experience @ Villa Ambience! I hope you go back. Owners great to work with, property well kept! Thank you so much we are delighted you enjoyed your stay. We love the area too - there is so much to see and do right on your doorstep and when you come home at the end of the day it is so peaceful. We look forward to welcoming you back in the future. We had such a wonderful stay in the villa, it really has all the home comforts you could ever want as well as views that you could never tire of. The outside spaces are ideal for relaxing and the heated pool is a real treat! The nearby towns are excellent with some great restaurants and bars. We loved staying here and hope to come back soon! Delighted you had such a lovely time and enjoyed the local restaurants and bars in the towns along the beautiful Cote Vermeille - so lovely to come home afterwards to beautiful views and peace and quiet! We look forward to welcoming you back in the future. We've recently returned from a brilliant week staying at Villa Ambiance. The house is fantastically well equipped & all the little details have been thought of, to make your stay comfortable & easy. The views from both the balcony & pool area are stunning and getting up early to see sunrise is an absolute must! The pool area is lovely, with a large seating area in the shade & loungers out on the decking for those sun worshippers. The pool is the perfect temperature to cool off from the sun & relax in (whilst having a beer enjoying the view!). We spent many evenings around the pool area, making use of the BBQ & amazing summer evenings. Cerbere itself is a lovely little village, with a Boulangerie, shop & a few bars/restaurants. There's a bigger supermarket about a 20min into Spain, in a town called Llanca. A visit to nearby Collioure for delicious Moule & Frites (look out for the place that serves them out of tin foil) is well worth it. There is also a great traditional market in the centre of Argeles by the church, where you can pick up bags, clothes, cheese, olives & saucisson etc. It's lovely to have a mosey around, take advantage of the local produce & then enjoy a drink in one of the nearby bars, whilst watching the world go by. Delighted you had such a great time - I love the market at Argeles and we always enjoy a drink afterwards at the café by the church. Glad you made it up to see the stunning sunrises - as you say so well worth it - the whole sky turns gold and red. 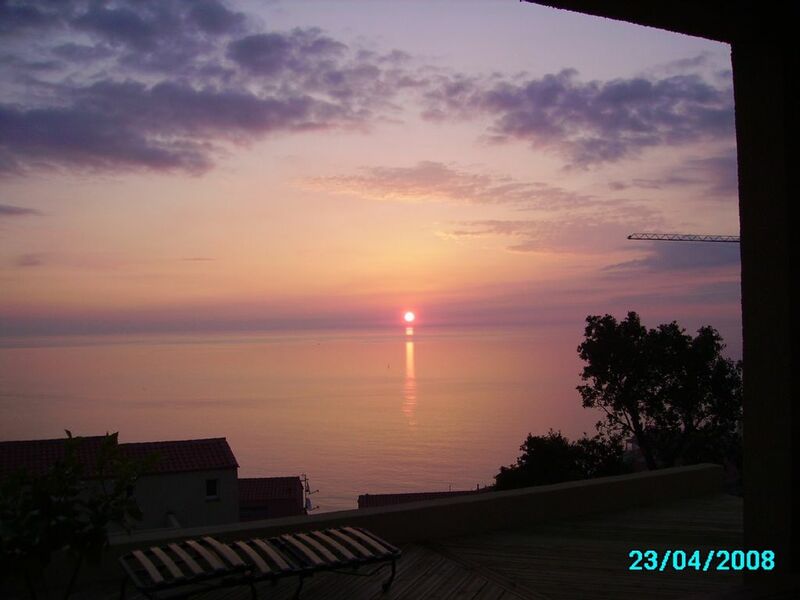 A wonderfully comfortable villa offering amazing views within a beautiful village setting. We stayed at this villa with friends in August 2016 and it was perfect for us. 4 children (7,6,3 and 3) and 4 adults were more than comfortable and the fittings are immaculate. The bedrooms, bathrooms and pool are all beautifully presented and the kitchen and living area allowed us the space to entertain and relax as required. We made good use of both the lower and upper outside eating areas, enjoying the panoramic views from the balcony for breakfast and making good use of the shaded bbq area (and the bbq) downstairs in the evening. Leading up to our stay the owner couldn't have been more helpful with hints, tips and guidance on the local area and this made our stay all the more comfortable. Cerbere itself is a short walk down the hill (though it was a little too far for our youngest (3) when the sun was blazing) and offers an authentic small town setting- square, shop, bakery and a handful of cafes and restaurants. The small stoney beach offers beautiful clear water and a couple of diving platforms too which we all loved. Perfect for spending a lazy day, with drinks and ice creams from the nearby cafes. We tended to cook in the villa most evenings (very hard to keep the kids away from the pool!). Cerbere is well positioned for daytrips- which we did using the railway which runs up the coast. Very simple and easy to understand. All in all a wonderful holiday. Thank you Margaret! So delighted you had a great holiday and that all the information I sent you was helpful - its so interesting to hear other people's perspective. Our entire family, children and grandchildren just love it out there so we are always pleased when other families have enjoyed it as much as we do. In all the years we've been there I've never swam out to that platform from the beach at Cerbere so I'll definitely give that a go next time I'm there! We also used the Euro 1 bus when we were there this summer which made a day trip to Collioure so much easier than trying to find parking. Thank you for your review. My wife and I recently spent a week in Villa Ambiance with our 3 young children and had a brilliant time. The villa has stunning views over the Mediterranean and is located on the hills above the beautiful town of Cerbère. The villa is very spacious and has everything you would need inside. The swimming pool and decking area provide plenty of space to relax and enjoy the sun. Cerbère also has a train station allowing you to explore the many towns and villages along the coast. Overall a fantastic location for a very relaxing and enjoyable holiday. Delighted you had a great holiday and that the children enjoyed the pool so much. After ten years we are still blown away by the beautiful views. Cerbere is such a pretty traditional village - we love it. Look forward to welcoming you back in the future. This is truly a wonderful villa, spacious, clean and has all the facilities you would need. The most amazing thing though is the view, it captivates you on arrival and has that real 'wow' factor. There are plenty of seating areas outside to relax, eat and enjoy the sunshine. It also has a lovely pool. The area is quiet and peaceful and people are very friendly. Valerie was great on arrival and really helpful throughout the stay. Cerbere is small but lovely and if you are looking for a villa which offers you space to relax as well as a base to explore then this perfect. We have a great holiday. Delighted you enjoyed your stay - we are still blown away by the views. It's just perfect to sit up in bed first thing in the morning with a cup of coffee and gaze out to sea! I will pass you kind comments on to Valerie - its great to know she's looking after our guests. On the road to Portes Vendres is the newly opened 'Site de Paullies' which is a nature reserve and conservation area ideal for its beaches, coastal paths, museum and picnic facilities - parking and entry are free. On the Costa Brava you can visit Cadaques, a very pretty coastal resort and then drive on to the Cap de Creus which is a nature reserve. You can drive down to the point and visit the museum of Salvador Dali then take in the breathtaking views from the bar at the top of the hill. Visit the enormous street market on the seafront at Empuribrava and also the beaches along the resorts of the Costa Brava, LLoret de mar, Tossa de mar, Llanca, etc. Drive into the mountains towards Andorra where there are medieval villages and monasteries to explore or simply walk in the vineyards that are about 50 metres away from the front door of the villa. The coastal walks in this area are breathtaking. A visit to the medieval town of Collioure is a must with frequent Catalan dancing. We require a deposit of £500/Euro for reservation. This will then be held as a security deposit until after your stay. The full amount is due six weeks before the rental period commences.